TBS assists ScrippsNetworks in developing a system where the company can monitor their network on a global scale. ScrippsNetworks chose SolarWinds network monitoring tools for this project because they are already using other products from them. Additionally, TBS is well trained on the installation and configuration of this product. Scripps Network Interactive is a leading developer of engaging lifestyle content in the home, food and travel categories for television, digital, mobile and publishing. The company dates as far back as 1878. The company’s headquarters is based in Knoxville, Tennessee but has offices throughout the US as well as internationally in London and Singapore. Scripps Network lifestyle media portfolio comprises popular television and Internet brands engages more than 190 million U.S. consumers each month. Internationally, Scripps owns TVN, Poland’s premier multi-platform media company and distributes seven entertainment brands in 29 languages reaching nearly 165 million households in more than 175 countries and territories. Scripps Network Interactive decided to upgrade their current technology plan. While they already had SolarWinds products in place they needed to improve on their installation. Upgrading was essentially effortless since Scripps was a new customer of ours referred to us by a previous employee who now works for us and they already were using some of the products. Working with us was also a no brainer for Scipps since our prices tend to be better than our competitors. Most importantly, though, we would never suggest a product or service that would not benefit our clients. When we suggested to Scripps that they should upgrade their SolarWInds products, not only would their technology be upgraded, but at the same time upgrading would provide a stable, high performance network. Now that Scripps Network Interactive and our team mapped out what was needed to manage their network with one platform, what follows is a detailed explanation of the products we rolled out to our clients. TBS decided that they would use SolarWinds, a platform that had all of the products necessary to operate Scripps network, which streams content worldwide. Server and Application Monitor – allows Scripps to quickly pinpoint the root cause of application issues. 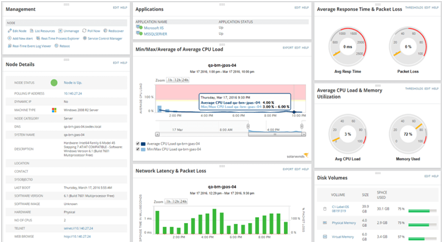 Network Performance Monitor – lets Scripps reduce network outages and quickly detect, diagnose, and resolve network performance issues. Network Traffic Analyzer – permits Scripps to create, schedule, and deliver in-depth network traffic and bandwidth reports with just a few clicks. Storage Resource Monitor – this is a comprehensive storage performance that monitors and alerts across all of Scripps’ storage arrays to ensure peak performance and avoid capacity surprises. Virtualization Manager – enables Scripps to analyze and remediate all virtual manager performance problems by viewing active, critical, and warning issues in their environment. Web Performance Monitor – assists Scripps in troubleshooting Web performance issues for internal & customer facing applications.